There is no question that income inequality in America is real. In fact, the income gap has been increasing for at least the last 30 years. According to the Washington Center for Equitable Growth, globalization, education, technology and specific government policies contribute to income inequality. And credible arguments can be made to support these conclusions. However, if you dig a little deeper, you can find additional factors that also contribute to the disparity: education level, single parent households, rural vs. urban living, race and gender. Clearly there are a multitude of reasons as to why there is such a lack of income equality. But instead of focusing on the why we have income inequality, I’d like to talk about how this disparity is affects us all. And that history shows us we cannot afford to continue to ignore this issue. Have compassion… and don’t lose your head! When I personally think about income inequality, one famous historical figure flashes in my mind over and over. Marie Antoinette, monarch during the French Revolution, is often portrayed as a wealthy aristocrat who was so out of touch with the suffering of poor people in France that she eventually faced execution by way of the guillotine. Historical folklore concludes it was this statement which further inflamed tensions between the haves and have nots within France—leading to the Revolution. I mean, could the queen be so out of touch with the hardships of so many people that she did not realize that cake is even more expensive to make than bread? Or that the making of a cake requires flour, which she was already told the people had none of. I really don’t think she was saying they should eat a flourless torte… To me the lesson is clear: We as a society should never become so isolated from the plight of the less fortunate. 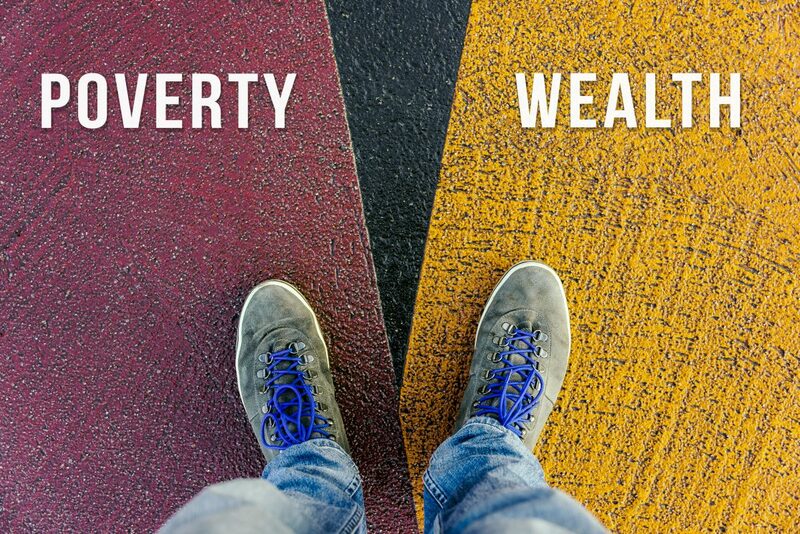 And the disparity is not just among the highest and lowest earners. 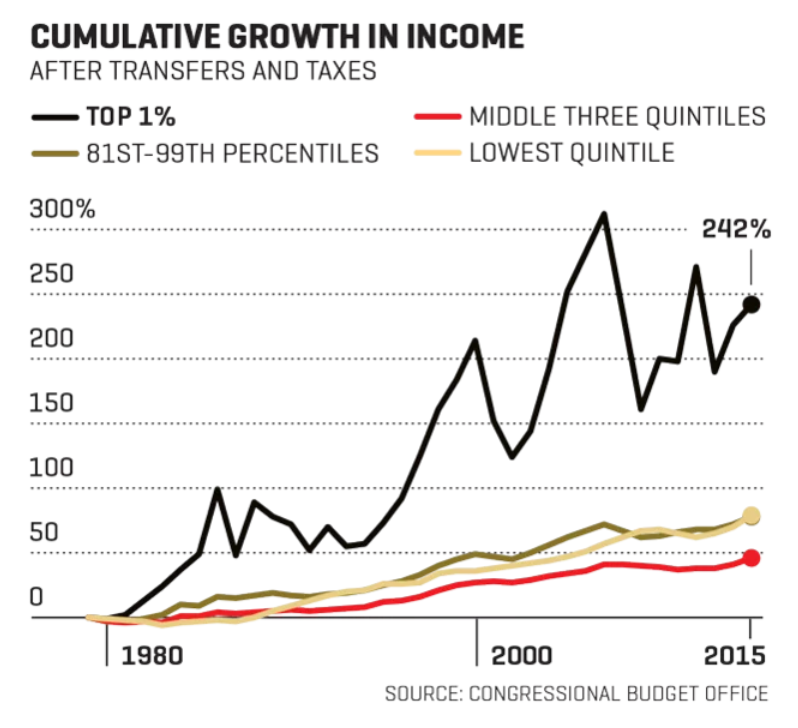 In fact, a 2018 report suggests that while the American middle class may not be shrinking, per se, it is falling farther behind wealthy earners, reflecting an overall rise in U.S. income inequality. This shocking chart shows how the middle class enjoyed the lowest cumulative income growth over 35 years. As a group, the middle class has been simply left behind. Such great income inequality was not always the case in America. Only decades ago, wealthy individuals (and the government) took some responsibility in giving back to society. People helped others get a better education… and livable wages were much more the norm. For example, after WWII the government introduced the GI bill that allowed veterans to purchase houses with low interest government loans. Instead, today we have the savings and loan scandals. Something clearly is wrong. And it is easy to keep our eyes closed and covered like Sandra Bullock’s character in Bird Box. All too often we refuse to look at the monster right before our faces. Well, as I always say we must educate ourselves about issues before we can take steps to solve and prevent them. At Grace Homemade, I provide fair wages to my employees and create jobs that promote economic development in my community. I have a diverse workforce and policies in place for working parents. I’m not changing the world, but I am doing what I can to make my world a better place by combating income inequality right here. I hope others will join me on this all-important journey.